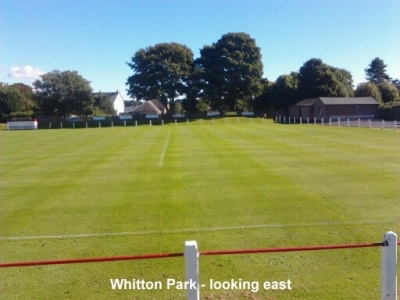 Whitton Park in Broughty Ferry is located on the north side of Arbroath Road (A92) - opposite Claypotts Castle - at the point where the road widens to accommodate Claypotts junction to the immediate east of the ground.Formerly known as Claypotts Park, Broughty Athletic's ground was re-named Whitton Park in 1989 to commemorate Eddie Whitton, who served the Club with great distinction for forty-five years.The neat ground, which can accommodate 2,500 people, is a very pleasant place to watch football on a nice day, but spectator facilities are basic.There is no terracing and no cover for spectators but there are grassed, sloping embankments on either side of the playing pitch and a flat area behind the goal at the Arbroath Road (south) end of the ground. There's only only entrance to the ground, from Arbroath Road, and this was resurfaced in 2012. To the right of this impressive new entrance area is a refreshment bar is situated within the Clubhouse. Map showing the location of Whitton Park in Scotland. It's definitely better than it was and I read some time ago that Broughty have plans to provide some cover for spectators, which should help to boost their crowds. You have the ability to request en edit to any of the details of Whitton Park. You can do this by clicking on one of the options below.